The Book of Caverns is an important Ancient Egyptian funerary text of the New Kingdom. Like many funerary texts, it was written on the inside of the tomb for reference by the deceased. It describes the journey of the sun god Ra through the six caverns of the underworld, focusing on rewards and punishments in the afterlife. 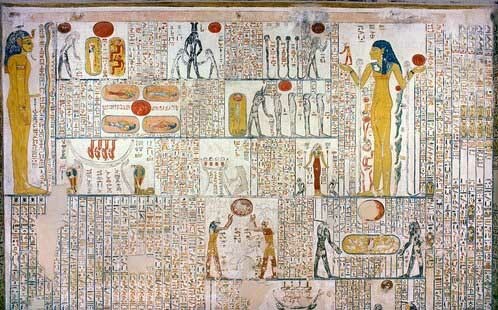 The earliest known version of this work is on the left hand wall of the Osireion in Abydos. 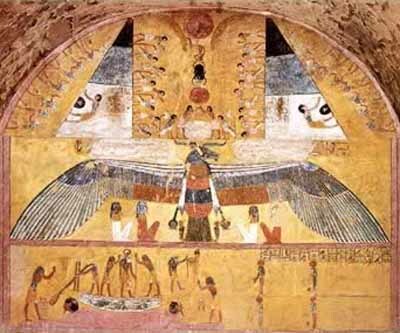 It appears in the tomb of Ramesses IV in the Valley of the Kings, replacing the earlier Amduat. This appearance was recorded by Jean Francois Champollion in his letters from Egypt. The book has no ancient title, and is not divided into hours of the night as other Ancient Egyptian funerary texts are. The Book of Caverns originated in the Ramesside Period. It is a text about the underworld that speaks of those who fail their judgment in the afterlife, and also the rewards of those who pass the judgments. The Book of Caverns is one of the best sources of information about the Egyptian concept of hell. The Book of Caverns is divided into two halves of six sections, and each half is divided into three other parts. The first half explains how the sun god Ra invokes beings and groups of gods. The other half is a descriptive text of the earlier books. The Book of Caverns is much more literary that other funerary books from the New Kingdom, such as The Book of Gates. It does not have as many pictures as the other books, but instead it is much more descriptive and lengthy. The book describes the journey and tasks Ra must go through to eventually end up in the Light. Ra must take souls through the afterlife journey through many caverns guarded by gods and goddesses. Each cavern has its own task and if the soul does not pass then it is sent to nonexistence. A soul that is condemned to nonexistence is beheaded and has its hearts ripped out of its chest. Section 1 of the book describes Ra and his mission to enter the darkness in order to defend and care for Osiris and direct the souls of the deceased. Snakes guard the first cavern's entrance. Ra must greet Osiris with his hand extended to him. Osiris is sitting on his shrine surrounded by the serpents. Osiris� beheaded enemies are below him beheaded; this is the Egyptian concept of Hell. Osiris and Ra condemn the beheaded souls to nonexistence. In Section 2 Ra must reach various gods and goddesses who are guarded by various serpents. Once he reaches Osiris, souls are once again sent to nonexistence. Nonexistence is known as the Place of Annihilation where the souls are punished by guards with knives. Sections 3 through 6 are about the damned and their punishment. The damned are shown on ovals in the walls of caverns, which is why the text is called The Book of Caverns. In the caverns the gods make sure each and every soul continues to serve its punishment. The Book of Caverns is the only known Egyptian funerary text to mention women being condemned to nonexistence. As all the souls are trapped for eternity in hell, Osiris is down there with them. However a sun disc protects him and serpents surround him. Since he is protected he is able to continue the process. The first known almost complete version of The Book of Caverns that only has its upper register damaged was located in the Osireion. It was discovered by archaeologists Flinders Petrie and Margaret Murray who were excavating the site in 1902 through 1903. The Book of Caverns was found directly across from the Book of Gates within the entrance passage on the left wall. The Book of Gates was located near the Book of Caverns because it also deals with death. Both books are based upon funerary texts of the New Kingdom, however they did not show up until the 19th Dynasty and were not in any of the tombs within the Valley of the Kings, except for that of Ramesses IV. Ramesses IV was the first to use one of the earliest passages from the Book of Caverns, rather than the traditional Amduat passages. Ramesses VI was the first to use the entire version of the book in his tomb, in the Osireion, with the Book of Gates in the front of the tomb. The passages of the book were written all over the walls of the tomb completely covering it in text. Ramesses VII went even further and had passages not only written on the walls but also on the ceilings and in the sarcophagus chamber. Jean Fran�ois Champollion first wrote about the Book of Caverns from the tomb of Ramesses VI providing some translations. Scholars, however, were not greatly interested in the book until about a century later when the second complete version of the text was discovered in the Osireion. In 1933 Henri Frankfort tried to write the first complete translation of the book with the help of Adriaan de Buck. It was not completely translated into English until 1941. From a fairly early point in Egyptian history, the concept of caverns in the netherworld became a motif of afterlife theology. Within these caverns, various deities, who were enumerated in the so-called "Spell of the Twelve Caves", stood ready to punish the wicked. The Spell of the Twelve Caves was a composition known from a papyrus of the time of Amenhotep II and from the walls of the southern chamber of the Osireion at Aybdos. Since the New Kingdom's 18th Dynasty, a section of this book was also made a part of the Book of the Dead (Chapter 168). With the first seven caverns were alternating groups of three mummiform and three anthropomorphic deities, two being male and one female in each group. In the eighth through the twelfth caverns, there existed a varying number of deities. For example, in the eighth cavern there were seven individuals and groups and in the ninth, there were as many as twenty. These goddesses of the night were not commonly represented, but appear in characteristically anthropomorphic form in some instances of the New Kingdom funerary texts known as the Book of Gates and the Amduat. We find them in the burial chamber of the tomb of Ramesses I in the Valley of the Kings at Thebes (modern Luxor) where they are depicted in an illustration of the third division of the Book of Gates. Six on each side flank a summary scene depicting the netherworld, in the center of which is a huge coiled serpent known as "he who should be removed". Each of the goddesses wears a five-pointed star on their heads, but otherwise are undistinguishable but for their names and the alternating colors of their individual costumes.